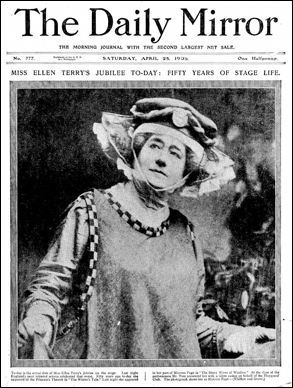 Ellen Terry was born in Coventry on 27 February 1847. The silent video below shows Ellen as an old lady in 1928 receiving a bouquet of flowers. Her first appearance on stage was in a production of The Winter’s Tale at the Princess’s Theatre in London in 1856, & she went on to take the child parts in King John & Macbeth & the part of Puck in A Midsummer Night’s Dream. 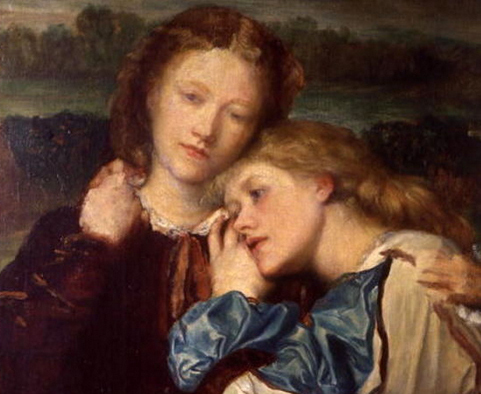 The Sisters by G. F. Watts. The painter Watts met Ellen & her sister Kate, who was also an actress, at Little Holland House in 1862. They subsequently sat for his painting The Sisters when Ellen was 16. Watts aged around 47 & Ellen Terry aged 16. Both photographs were taken by Julia Margaret Cameron around 1864. Encouraged by his friend & benefactress Sara Prinsep, Watts proposed to Ellen Terry & they were married on 20 February 1864, despite the thirty-year age difference between them. Watts said that he married Ellen, who had recently launched her adult theatrical career, to save her from the corruption of the stage. Julia Margaret Cameron, one of Prinsep’s sisters, had recently moved to the Isle of Wight, purchasing Dimbola Lodge, & the newly married couple decided to honeymoon there. During Ellen’s stay on the Isle of Wight, she spent time with the Tennysons, playing with Hallam & Lionel & taking walks on the Downs with the poet. Although Ellen grew to dislike the atmosphere at Dimbola Lodge, where she was treated like a child & had to endure the constant interference of Sara Prinsep, Ellen became a muse for members of the circle. Choosing by G.F. Watts. 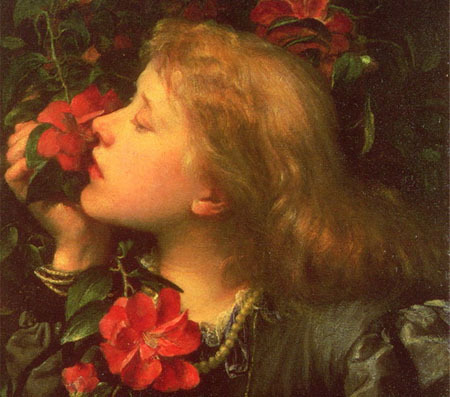 A painting of Ellen Terry aged 16. Julia Margaret Cameron took two photographs of Ellen Terry, one entitled The South West Wind from Life & the other Ellen Terry. Ellen inspired many of her husband, Watts’s, paintings, including Choosing & a Portrait of Ellen Terry. 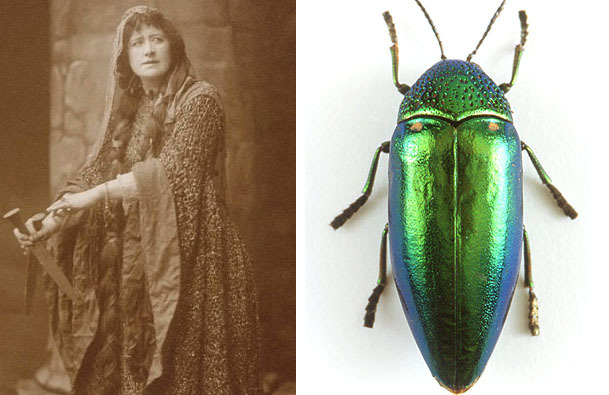 Ellen Terry as Lady Macbeth wearing the famous dress made of green Jewel Beetle wings. When the marriage ended after less than a year, Terry returned to the stage & went on to become the most famous & successful actress of the Victorian period. During her long career she played some of the most celebrated female parts, including Lady Macbeth, Portia from The Merchant of Venice & Beatrice from Much Ado About Nothing. She also starred in some of Tennyson’s plays, & was praised, in particular, for her role as Rosamund in Henry Irving’s 1893 production of Tennyson’s Becket.